Wow, we’re already at week 3 of GBBO! This week, the bakers faced the bread challenges. They started with quick breads, then onto Paul’s technical challenge of baguettes. Back to the baking….I was sooo pleased to have received one of the Great Blogger Bake Off ‘Star Baker’ badges last week (for my Arlette bake) I decided to square up to the technical bake again and challenge myself with baking baguettes – just how difficult can it be? *Nervous chuckle! I do enjoy making bread, the smell is beautiful, though I’m not always successful. So, the baguette. The Great British Bake Off episode explained that it should have a crisp crust which is achieved through the use of steam in the oven. It has an open texture, though less so than ciabatta. This is done through having quite a soft loose dough mixture (high water content) and by not knocking the mixture back after its first prove. From the GBBO Celebrations book, accompanying series 6, I learnt that this dough is handled gently after the first prove and isn’t knocked back. 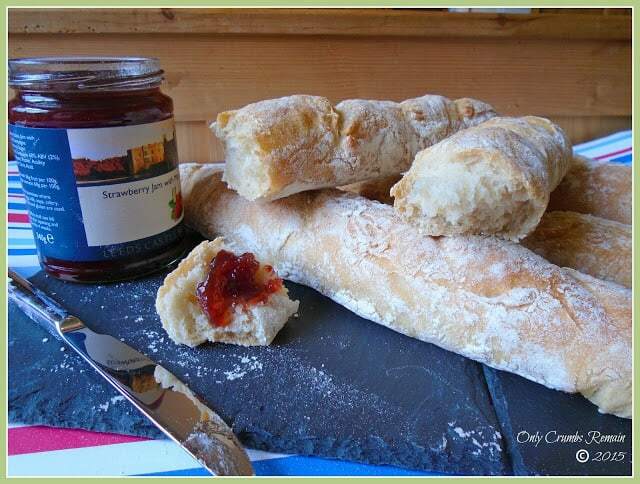 The plastic container which the contestants were supplied with helps the dough to form an oblong shape which is then harnessed to form the traditional baguette stick. The dough is gently shaped into long sausages before their second prove, and are laid between folds of strong linen (baker’s couche) to help the bread keep its shape during the second prove. The baguettes are then baked at a high temperature with steam, which creates the desired crusty casing. Post Script: Since making these baguettes, Mr E & I have come across these baguette trays in Sainsburys (though I’m sure other shops with baking sections would house similar things). As they’re made of a metal, the dough can be shaped and proved and then popped straight in the oven without the need to transfer them to a baking sheet as when using a baker’s couche (or tea towels as I used). And the result? Yes, they do look like a baguette with a crisp crust and irregular shaped air pockets within. However, they certainly aren’t ‘perfect’, such as the slashes across the top – I think it would have been better to use an actual baker’s specific tool for that. As they say, practice makes perfect. However, for a first attempt I’m more than happy with the result – and they taste pretty damn good too, which, let’s face it, is main thing! Time: hands on time 25 minutes; plus proving time of about 2 hours; 20 – 25 minutes bake time. 1. Make the dough. Place the flour in a good sized bowl, with the yeast to one side and the salt to the other. Combine the dry ingredients with your hand. Make a well in the centre and pour in 3/4 of the water. Using your hand, mix the flour with the liquid, adding more water to make a fairly loose dough. You should need all of the water. Bring the dough together, cleaning the bowl as you do so. Place the dough onto a clean work surface and knead for 10 – 12 minutes, avoid adding any extra flour. The dough will become stretchy, soft and silky. Perform the ‘window pane’ test to ensure the dough has been kneaded enough. 2. Set aside to rise. Place the dough in the oiled plastic container. Cover it and set aside until it has at least doubled in size. The length of time this take depends on the temperature of the room, though ours took just over an hour. Try not to rush this process, as the slower rise will develop more flavour. 3. Prepare the baker’s couche. Lay the baker’s couche (or clean tea-towels laid on top of one another) on the work surface near to where you are going to shape the bread. Dust liberally with flour. Lay a chopping board (or similar) along one of the short ends to prevent it from moving. Create a fold in the material so that the first baguette is not butted against the chopping board. 4. Shape the dough. Tip the dough onto a floured work surface. Use a sharp knife, dusted with flour, to gently divide the mixture into 4 equal strips. Shaping one baguette at a time, gently flatten the dough into an oblong. Lay the long edge furthest from you along the centre line, do the same with other long edge. Nip the two edges together gently. Roll the dough gently into a sausage shape, about 30cm long (or no longer than the baking sheet you have), trying not to apply much pressure but enough so the dough creates the classic baguette shape. 5. Lay the shaped baguette on the baker’s couche. Place the shaped dough, seam side down, onto the baker’s couche (or tea-towel) so that it is parallel to the chopping board that you positioned against the short edge. Create another fold in the material alongside the baguette you have just laid down. 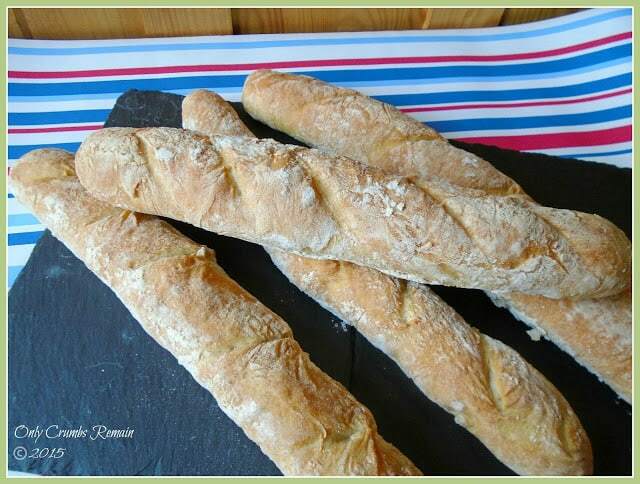 Shape the next baguette and lay it next to the first baguette, with the fold of material between the two. Continue until all 4 baguettes are shaped. Position another board (or similar) along the short edge next to your 4th baguette, though not too close so that it impedes its prove. 6. Prove. Cover the shaped dough with a clean tea-towel to prevent the air from developing a skin on the dough thus preventing the it from rising again. Leave for about an hour. They will be ready to bake when the dough springs back quickly after touching it. 7. Pre-heat the oven. Place a roasting tin in the bottom of the oven and preheat the oven to 240c / 220 Fan / Gas 9. 8. Transfer to the baking sheet. Line a baking tray with greaseproof paper. Gently roll the baguettes on to the tray. Avoid lifting them as this will alter their shape. Use a very sharp knife to quickly create 4 or 5 diagonal slashes across the top of the dough. 9. Create the steam & bake. Quickly pour a pint of water into the heated baking tray and place the tray of shaped baguettes into the oven. Bake for 20- 25 minutes, until they are a lovely golden colour, the crust is crisp and the underside of the baguette sounds hollow when tapped. Transfer to a cooling rack. I love baguettes so much!! But I haven't been able to make them, I always finish with a hard thing impossible to eat. I will try to make some with your recipe. Pinning! Thank you re our baguettes, Mr E is also bread obsessed and the bread soon disappeared despite there being 4 sticks. Than you Amanda, they really were incredibly yummy! Thank you Charlotte, you're too kind. I've been enjoying trying to make things from the GBBO as, although they don't always turn out as I want them to, I've learnt so many things by trying, I guess most people will have found the same. Thank you Becky, they're a tricky beast aren't they. Mr E usually proof reads my posts to not only check for spellings etc but as he's not a baker, he reads the method trying to imagine making said bake. If he can imagine it, then we're usually happy with the wording. Do let me know how you get on with the baguettes if you try them again. Your baguettes look great! I am too scared to try the technical challenges! Thank you Lucy. I've been enjoying trying some of the technical challenges, we've decided to make the ones thus far because they are the bakes that attract me the most from the 3 categories. I've learnt so much from doing them. PS. Your cat is gorgeous. Thank you Jen, I'm finding the GBBO bake alongs a great way to challenge myself a little; and in the process I'm learning quite a lot by actually doing the bakes rather than just reading about them. Ooh yes, you definitely should give bread making a try, the smell is just lovely as it bakes! You know how good the smell is when you pass the fresh bread area in the supermarket. Aw thank you Cathy. They're tricky beasts aren't they…..and yet they contain such simple humble ingredients! Your baguettes look amazing! Is not the easiest thing to do and they turned out great. Aw you're too kind Anca! They're certainly not easy, but I've learnt a few things for my next attempt. Your welcome, and cheers for hosting. Wow, they look great! I had a go at them too, and they were actually a lot less stressful to make than I thought they would be… although that's probably because I had the full set of instructions compared to the contestants! Thanks Hannah 🙂 Yeah, I don't envy them being in a tent with cameras peering at their every move whilst trying the understand scant bake instructions all within a limited time frame!! Not easy. Aw thank you 🙂 I think I must have had a large dose of beginner's luck showered over me 😉 I can certainly see areas where I can improve them when I tackle them again. well done on attempting baguettes and i think yours look really good. the homemade 'baker's couche' is very clever! i must try it myself as my OH adore baguettes with cheese! Thank you Jenny 🙂 Yes do give them a go when you have chance, they do taste very yummy! Aw thank you Liz, you're too kind 🙂 I think Paul H would have a thing or too to say about my baguettes (as he did with the contestants last night). Mmm.. you know what? I never knew how complex it was to bake baguettes! Yours look fantastic. Ha-ha-ha, nor did I Saskia! 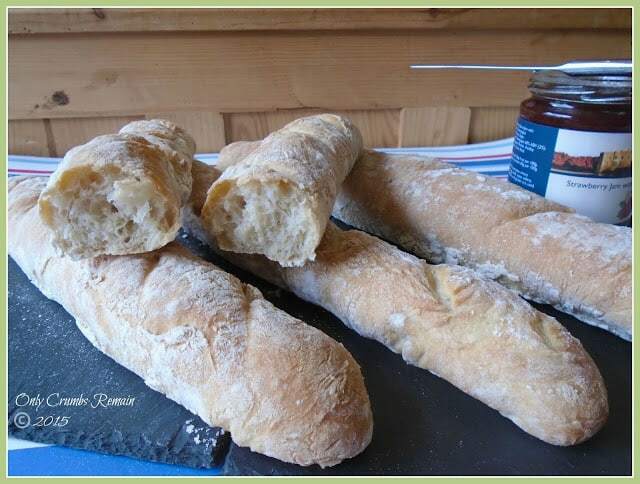 Hubby & I decided baguettes would be a nice bake to make – but boy o boy, they're not easy. It's so difficult trying to shape the dough without knocking the air out! Paul certainly chose a corker of a technical challenge there!